Global crude oil demand may slow in 2019 on tighter liquidity and a slightly higher risk of economic down cycle. However, lower prices and downstream expansion, in particular in the petrochemical sector, will be supportive. The US remains a wildcard, with no intent to be tied in a production agreement. Price and supply wise, its Middle East ally Saudi Arabia still stands at loggerheads. The level of geopolitical risk will remain steady, including the US hard stance against China and Iran, and volatile politics in the wider Arab Gulf region. 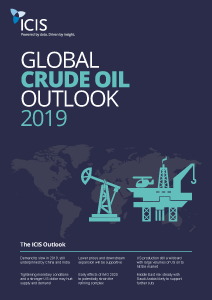 The ICIS Global Crude Oil Outlook 2019 provides a brief risk overview of the market, with a regional breakdown of the key trends that will shape demand and investment throughout the year. The ICIS LNG Outlook for 2019 provides a country-by-country forecast of the key developments, projects and trends that will shape the market. The ICIS Natural Gas Outlook for 2019 provides a comprehensive regional breakdown of the developments driving the market. The ICIS European Power Outlook 2019 provides a comprehensive regional breakdown of the developments driving the market.